At Gurteen Transport, we offer truck mounted forklifts (moffett mounty fork lift trailers) where our customers need us to handle their goods. 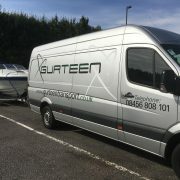 The Gurteen vehicle fleet utilises a number of truck mounted forklifts known as Moffetts or Moffett Mounty forklifts avaliable. 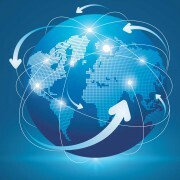 Giving you more options when looking for the right transport logistics service. Moffetts are special forklifts which are trailer mounted and offer one of the most flexible portable delivery systems currently on the market. 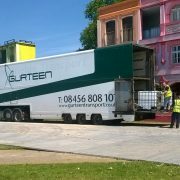 In addtion, the truck mounted forklift is lightweight in design and simply sits on the back end of a trailer and is permanently carried around and detached once on site to provide an excellent lifting solution. Again, the design of the unit means that when fixed to the back of the trailer there is only a very short over hang, which therefore meets with trailer regulations. The flexibility this forklift provides is substantial – the forklift can handle loads up to 1600kgs and will operate even on rough ground. The truck uses a powerful yet quiet diesel engine, making it a great option for those working close to other business units. Moreover, it is also both strong and reliable with excellent manoeuvrability. RGF has an impressive range of Moffett Forklifts available for immediate use, and we use these units on many of the high profile contracts currently with our customers. 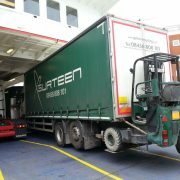 At Gurteen Transport, we aim to meet your transport needs as well as other business requirements such as Storage Solutions and Stock Management, in order to provide you with a wholly inclusive service. Our sales team will discuss your delivery requirements with you and can offer Moffett Forklifts where required.